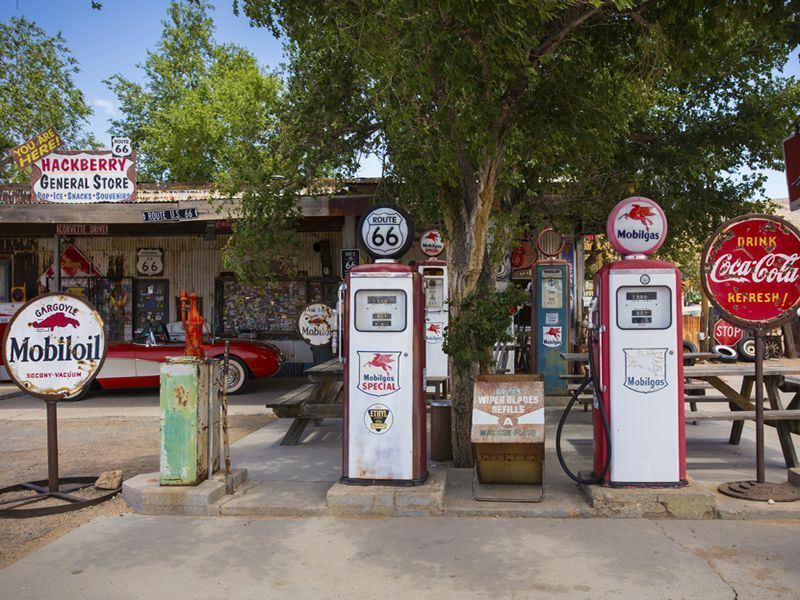 America is hands down the land of the wide open road trip, and no road personifies that freewheeling spirit better than Route 66. One of the first national highways ever built, Route 66 grew to become so much more than simply just a pile of tarmac, it became an American travel legend. To this day, much of Route 66's appeal is the 'Mom and Pop' motels, small gas stations, and quirky attractions that sprung up along it. While most of the original route has been replaced by interstate superhighways today, you can still get your Route 66 kicks by taking a self-driving tour with American Sky, which will guide you as close to the original path as you can possibly get nowadays. Seeking out the quirky roadside attractions are one of the highlights of any Route 66 road trip, and these are some of my favourites. An example of a quirky roadside attraction designed to drum up business, the Gemini Giant is a massive statue of a man in an astronaut uniform and helmet hoping to attract motorists to a nearby restaurant. Named after the Gemini space program and holding a silver rocket ship in his hands, the Giant has become a mainstay on America's Main Street and is a great stop and photo opportunity. You don't usually think of a bridge as something quirky, but this one is sure to change your mind, by 22 degrees. The Chain of Rocks Bridge spans the Mississippi River from Illinois to Missouri, but unlike almost all bridges that simply go straight, this bridge bends in a dramatic fashion halfway over the river. The bend may only be 22 degrees, but it had to feel like much more to original drivers of Route 66. Nowadays, the bridge is just a walking and biking trail, and it makes a good place to get out of the car and stretch your legs while you take in a view of St. Louis' famous Gateway Arch. Originally part of a roadside waterpark, the Blue Whale of Catoosa has grown to become one of the most famous and quirkiest stops on all of Route 66. The Blue Whale has now been restored and you are more than welcome to walk through her jaws to see the slides where people used to shimmy down into the lake. Even if you don't take the dip, which I'm pretty sure isn't allowed anyway, you still get to feel like all those kids and travellers did in the past. How would you like a free steak dinner to go along with your Route 66 adventure? Well, they have a free one waiting for you at the Big Texan Steak Ranch in Amarillo, Texas. All you have to do is eat the whole thing, a mere 72 ounces. Oh, and a bread roll, shrimp cocktail, salad, and baked potato. After lunch at the Big Texan, why not hop over to the Cadillac Ranch, which is definitely a one-of-a-kind experience. In the mid 1970's, ten Cadillac cars were stuck into the ground and now stand as a sort of quirky and artistic memorial to the glory days of Route 66. Visitors are encouraged to spray paint the cars, and many do with their own initials or hometowns. When the Eagles' song "Take it Easy" became one of the most popular pop songs of the 1970's, a Route 66 stop was inadvertently born. The opening line of the second verse of the song is "I'm standing on a corner in Winslow, Arizona", and the town soon followed suit with a park home to a statue of a man with a guitar and a mural of scenes from the song allowing visitors their turn to stand on a corner in Winslow, Arizona. A stop in Oatman is a great way to see some real Wild West history and see some wacky wild burros. Wild burros, descendants of working animals that were released by prospectors, roam the town of Oatman and you can feed them carrots, which are sold at many shops in town. These motels were a part of a chain of hotels throughout Route 66, but they are now the only two that remain. At these motels, the guest rooms are enclosed in a replica of a Native American tepee, or as they were mistakenly called by the original owner, a wigwam. These quirky tepees were no doubt constructed to catch driver's eyes, and after one look at them, you probably will decide to stay the night too. After all, who wouldn't want to stay in a wigwam, I mean tepee?